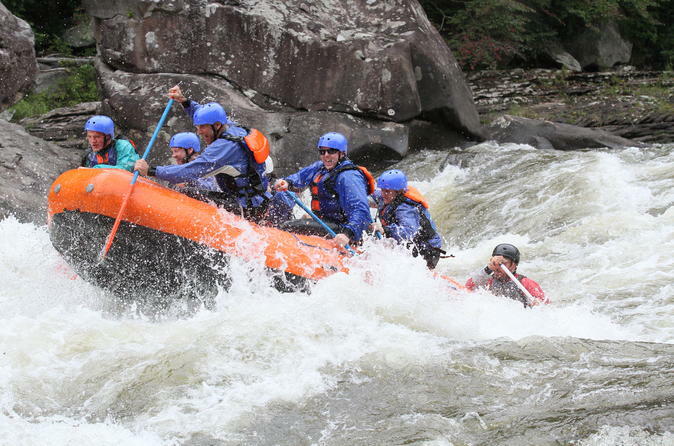 Quite possibly one of the best river trips in the country, the Lower Gauley offers some of the single biggest waves, gigantic holes and steep drops runnable by raft. The Lower Gauley serves up 55 rapids rated from class I-V, with most of them III or higher. With the help of a professional guide, you and your crew will tackle this whitewater fanatic’s favorite. It’s no wonder that guests flock from around the world to catch one of these 22 release dates. Delicious hot lunch included. Meet your rafting trip leader at the departure point. You will listen to a brief orientation and get your gear (personal flotation device, helmet and paddle). Then, you will have a 45-minute ride on a school bus down to the river put-in. Your guide will go over additional instructions once you get in the raft. The trip begins with a few smaller class I-III rapids as you ease into paddling and working as a team. Then, you hit some bigger rapids rated class IV-V. About half-way through the trip, you will pull over and eat a grilled hot riverside lunch on the shore. After lunch, you will continue downstream into some more booming whitewater. Here you’ll go through several rapids rated class III-V, like Koontz’s Flume and PSH. Between rapids, there is time for a swimmer’s rapid and maybe (based on water levels) jumping off of rocks. A return shuttle with complimentary beverages brings you back to the resort.